Leasing an aircraft is one of the best and most expedient means (short- or long-term) to access the benefits that business aviation provides, and / or avoid a sizeable initial expenditure. As a prospective business jet or turboprop user, you gain actual operational experience, which enables full analysis of the substantial value a business aircraft provides, without a large capital commitment. Leasing out your aircraft is also an excellent method for owners to preserve asset values in a challenging economy. Obviously, the most advantageous approach, whether you are the lessee or the lessor, is always determined by your individual or corporate financial and revenue parameters. However, there are variations and hybrid concepts that may come into play, and which your Holstein Aviation team member can share with you. Further, the assets that we can make available to you for short- or long-term leasing span the entire range of business aircraft, from turboprops to light and midsize jets, or the large cabin, long-range category. Flight departments find that they benefit from the expertise we provide to assist with or conduct lease negotiations, along with putting the airplane into service. If you are new to business aviation, we can also assist you with the hiring of an aircraft management company. This way you can focus on your business, and we'll do what we do best - get you into the air quickly. However, when you partner with the professionals at Holstein Aviation, there are things that you can't buy or lease: the knowledge, experience, expertise and excellence gained from 300 years of combined experience and more than 4,700 transactions that created value in excess of 10 billion dollars. Everything we know, everything we do, and everything we know how to do, is automatically part of everything that we do for you. And all at no extra charge. There are essentially three different approaches to leasing a business jet or turboprop. While complex, and certainly possessing many opportunities for a less than advantageous outcome, these concerns will not be of concern to you when your partner is the Holstein Aviation team of professionals. This brief summary of various aircraft lease types provides an overview for your starting point. The details, features, benefits and drawbacks are all well known to us. With us on your team, they will also be well known to you. This lease program is all inclusive and covers the fixed costs associated with aircraft ownership: flight and cabin crew salaries, hull and third party liability insurance, inspections, scheduled and unscheduled maintenance, aircraft registration, necessary loose equipment, operating manuals, training, and navigation databases and charts. As the lessee, your responsibility is the direct operating expense: fuel, oil, landing, handling, parking and storage charges, crew meals, lodging, transportation, incidentals, visa fees, import duties, local taxes, and flight or navigation charges by foreign government agencies and non-US air traffic control organizations. You also provide the desired amount of passenger, luggage and cargo insurance coverage. A standard format is a fixed monthly block rate, which includes a set number of flight hours. This is paid even if the aircraft is not used, or if fewer hours than allowed are flown. Any additional flight time over the base amount is charged at a set hourly rate. One common variation is a fixed monthly fee, with each flight hour then charged at a set rate. This is another name for the ACMI lease. Term length is usually at least one month up to one or two years (short-term lease). A time period of greater length is normally considered a long-term lease (two to seven years). Term length affects the total lease cost, with longer terms generally providing a lower monthly payment. Lease terms of less than 30 days are typically viewed as ad hoc charter. A variation is the so called Damp Lease. This is an ACMI lease with the exception that you as lessee provide a properly certified cabin crew. Primarily utilized by leasing companies and banks, only the basic aircraft is provided for the monthly rate. You, as lessee, provide the crew, maintenance, insurance, and all direct operating costs (outlined in the ACMI lease section above). Additionally, you register the aircraft and put it on your own operating certificate. With a lease term of two years and up, there are also normally certain depreciation, maintenance and insurance ramifications. Within this type of lease are two variations: operating and finance. Commonly used for terms ranging from two to seven years, an Operating Lease is short compared to the operational and economic life span of the aircraft. As the lessee, the asset does not appear on your balance sheet. 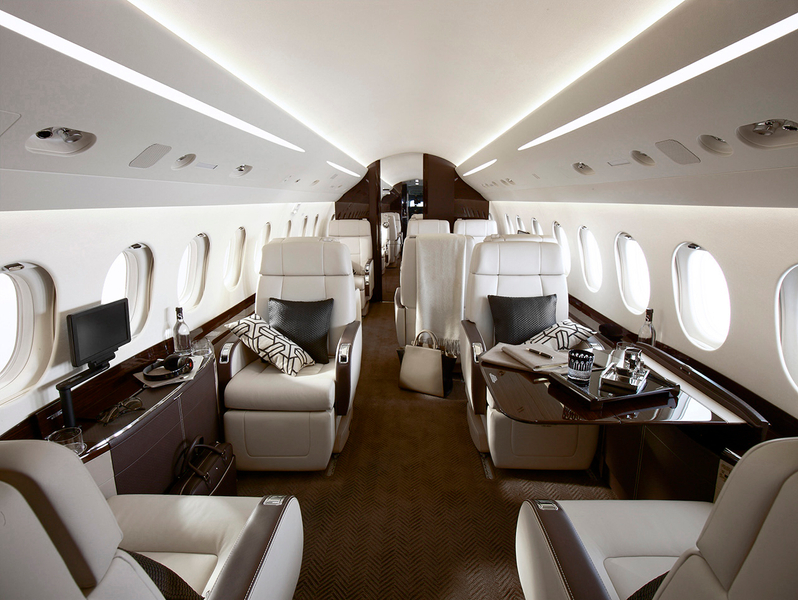 Very rarely will a company not receive advantages from using business aircraft. Obtaining those benefits can be accomplished several different ways - from sole or fractional ownership, to a partnership, to charter and leasing. Each method has positive aspects, the value of which is determined by your travel requirements, desired level of productivity increases and opportunity cost, as measured against your specific financial and operating parameters. Leasing allows quick access to a business aircraft without the need for large capital expenditures, substantial debt or long-term commitments. If new to business aviation, this avenue also enables you to "try before you buy". Finally, in a challenging economic environment, you, as a lessee, benefit when negotiating terms from downward price pressure on the aircraft owner / lessor. Marketplace uncertainty caused by a weak economy also enhances the desirability of leasing. Without that mythical crystal ball, no one can truly know where aircraft values are headed, even in the short term. But, when coupled with a purchase option, leasing can lock in a much more advantageous acquisition price at the lease termination date, particularly during expanding economic times. Leasing also provides an escape if aircraft values drop, if your requirements change, or if, in the end, the type of aircraft that you have been leasing truly isn't the best fit for your mission. For an established flight department, partnering with the Holstein Aviation professionals frees you to focus on doing what you get paid to do - operate safely, efficiently and cost effectively. We do all the work for you to identify, research and evaluate candidate aircraft. Then we assist you with the lease arrangements, or negotiate the lease for you, put the airplane into service, and make sure everything moves forward rapidly and smoothly. If you are researching the benefits and advantages of a business jet or turboprop for the first time, there is no better way to ensure a good outcome than your decision to partner with the knowledgeable and experienced professionals at Holstein Aviation. The range of available aircraft, multitude of equipment options, and operational and maintenance requirements can be daunting. This is where we really add value for you. We make sure that mistakes and missteps are missing. Over payment or over commitment is never overlooked. And, the potential for a real financial or operational problem is prevented. There are many alternatives for accessing the benefits and advantages of business aviation. But there is one best way to ensure true success - partner with the professional team at Holstein Aviation. Things change. In business, changes often occur at lightning speed. Travel requirements, cash flow, economic conditions, marketplace realities, funds allocation, sponsorship and ownership are just a few of the many and common factors that affect both aircraft owners and non-owners alike, whether individuals or corporations. Even though you know the current challenging circumstances will change for the better in the future, you still may need to address asset management issues and the related expense requirements for one or more of the business aircraft that you currently own. While the first response to less than favorable changes in any of the above situations is usually to sell an asset, it may not be the best course of action, either in the short term or over a longer range time frame. If sold, the current market value of your airplane could simply present too much of a loss from the original investment to be palatable. Or, you know the situation will resolve itself at a point where your business aircraft becomes more necessary than ever. And sometimes cash flow is just better served in the short term by temporarily eliminating a certain amount of monthly fixed costs. For any or all of these reasons, and others specific to your individual scenario, you are re-evaluating business aircraft utilization. This is where leasing your aircraft to someone else can pay dividends. First, you eliminate the overhead for whatever time period desired while still maintaining certain tax advantages and residual value of a capital asset. Second, you also maintain credit worthiness while possibly also adding to the borrowing power that you currently enjoy. Third, there may be the opportunity to retain at least partial access to the aircraft. If this sounds complicated, it can be. But it is not daunting, or even difficult, when you partner with the professionals at Holstein Aviation. More than 300 years of combined experience encompassing 4,700 transactions valued in excess of 10 billion dollars is at your disposal. For every alternative, the potential, as well as the potential pitfalls, are well known within our organization. We also know the market place, the prospects, the sources of funding, and every other aspect you need to develop a prudent and beneficial plan of action. And we put it all to work for you. Quickly. No matter how much things may change, there is one constant upon which you can rely: the knowledge and expertise within the Holstein Aviation organization, and our dedication to be of service and add value to you.